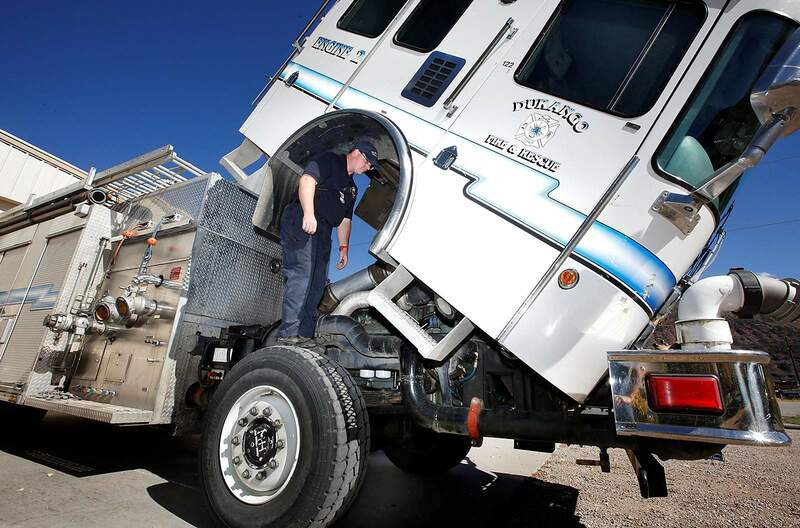 Brock Fortson, a volunteer with Durango Fire Protection District at Station 6 on U.S. Highway 550 near Trimble Lane, is required to check fluid levels and maintenance on aging vehicles. 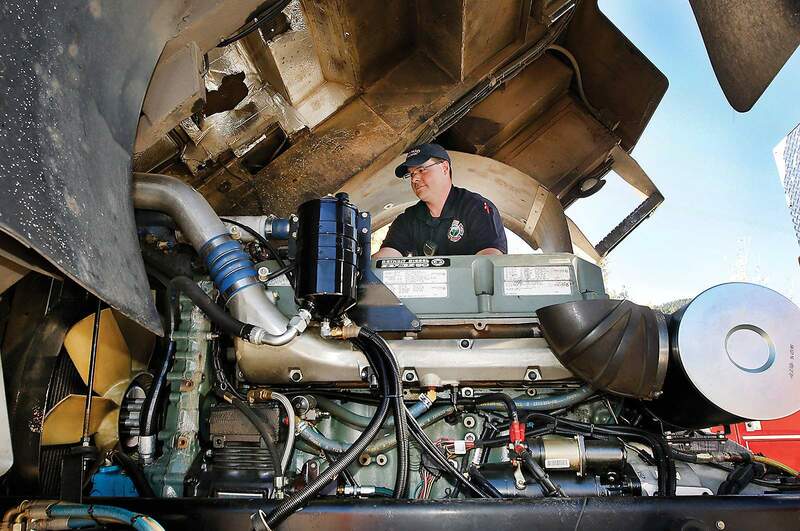 The engine was purchased in 1999, has 45,000 miles on it and has operated for 35,000 hours. Older equipment is moved to stations in the district that have fewer calls than others. Brock Fortson, left, a volunteer with Durango Fire Protection District at Station 6 on U.S. Highway 550 near Trimble Lane; Greg Child, center, volunteer coordinator with DFPD; and Ed Rozycki, a volunteer, check a 1998 rescue vehicle. Aging Durango Fire Protection District firefighting and rescue trucks are parked at Station 6 on U.S. Highway 550 near Trimble Lane. Older equipment is moved to stations in the district that have fewer calls than others. Brock Fortson a volunteer with Durango Fire Protection District at Station 6 on U.S. Highway 550 near Trimble Lane, is required to check fluid levels and maintenance on aging vehicles. This engine was purchased in 1999, has 45,000 miles on it and has operated for 35,000 hours. Older equipment is moved to stations in the district that have fewer calls than others. 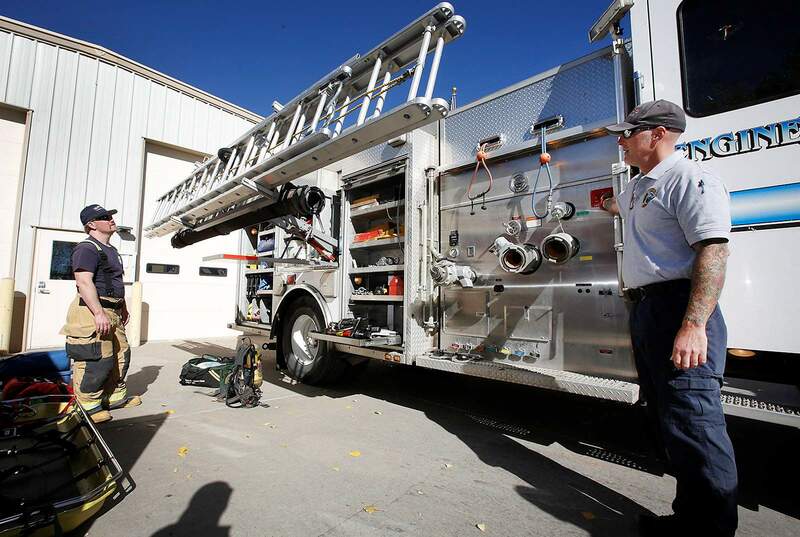 Ed Rozycki, left, a volunteer with Durango Fire Protection District, and Greg Child, volunteer coordinator with DFPD, demonstrate how ladders are lowered on a older engine at Station 6 on U.S. Highway 550 near Trimble Lane. Older equipment is moved to stations in the district that have fewer calls than others. 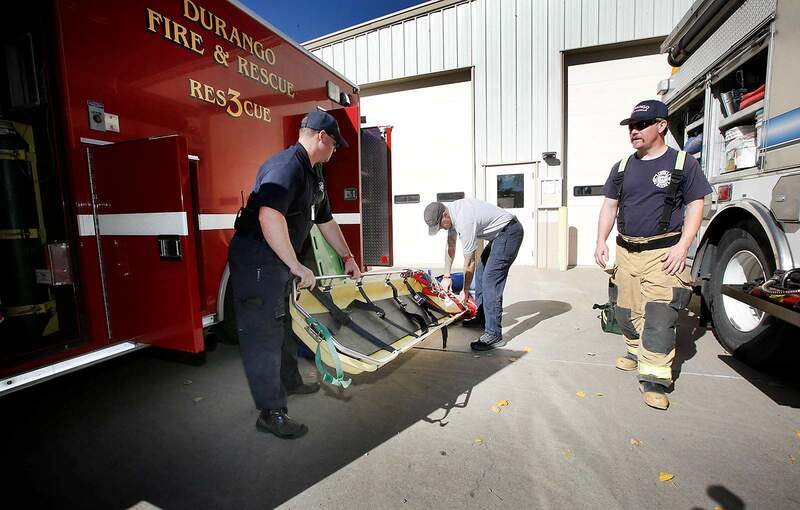 On their November ballots, city and Durango Fire Protection District residents will be asked to increase their property taxes to pay for more firefighters, fire stations and a training facility. Voters will see two different questions, depending on where they live, but the increase of 2.5 mills is the same across the entire district. The district includes 16 fire stations and covers 325 square miles. It is 58 miles long, stretching from San Juan County on its northern edge along U.S. Highway 550 to the New Mexico border. In recent years, the fire district has been using cash reserves to cover expenses, which is not sustainable, said Fire Chief Hal Doughty. This year, the district planned to spend $438,000 from reserves. Without an increase next year, the district would need to spend about $500,000 from reserves, he said. The tax will generate about $3 million annually. 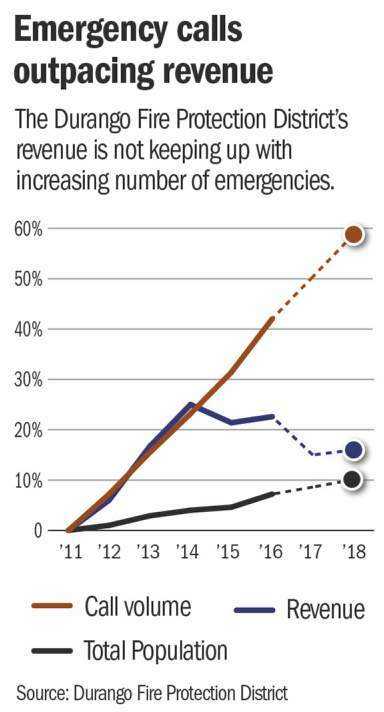 The district’s revenue shortfall is driven, in part, by rising demand for medical services. Many patients rely on Medicaid and Medicare insurance, which do not pay for the full cost of patient care. Revenues are also falling because of the Gallagher Amendment, which requires the state to lower the assessment rate for homes when residential values increase faster than nonresidential property values. It is impossible to know how long the mill levy increase would sustain the district because Gallagher continually readjusts the property assessment rate, said fire district board President Kathy Morris. IF THE PROPERTY TAX DOESN’T PASSDoughty said people in emergencies could wait longer for help because the fire district would likely have to cut services and staff without more funding. “That’s why we have got to have our community come forward and support us in this mill levy. This is not what we want to see happen,” Morris said. Fast response times can improve someone’s chances of survival, Doughty said. “If a human being has stopped breathing, you’ve got a period of about four to eight minutes in which their tissue remains viable, so if we can get to them within that four to eight minutes, then we have a really good shot at giving them oxygen,” he said. Time is also key for serious trauma victims, the goal is always to get them to a hospital within an hour, he said. Volunteers cannot fill a gap left by professional staff because they can’t leave their full-time jobs multiple times a day to respond to emergencies, he said. Even if the ballot question fails, the fire department plans to rebuild Station 2 near the intersection of Veterans Way and Camino del Rio. The fire district has set aside $5 million to replace the building, which has ventilation problems among other issues, he said. “This mill levy vote doesn’t have anything to do with the downtown fire station,” he said. But the district could not afford to replace or improve stations in other areas. “It will put us in a tremendous bind if we don’t get this mill rate through,” Doughty said. New fire impact fees on new construction could still be imposed by votes of the Durango City Council and the La Plata County Commission, but those would only meet 24 percent of the future construction and equipment needs of the district. IF THE MILL RATE DOES PASS With additional money, the fire district would eventually be able to increase the number of people working each day from 18 to 26, he said. The total number of career staff would increase from 54 people to 78 people. “I think we will be able to improve our response times,” he said. But before the district can hire many more people, the district will have to build or improve facilities to house them, he said. The highest priority construction projects for the district are Station 2 near the intersection of Veterans Way and Camino del Rio, Station 3 on 32nd Street, Station 7 in Three Springs and a new training facility in Bodo Industrial Park. The downtown station is the highest priority because it is far too small and it has ventilation problems among other issues. However, negotiations between the fire district and the Durango City Council are on hold and will need to be restarted after the election, so it may not be district’s first construction project. It is possible the district would start construction at Station 3 on 32nd Street to house full-time staff to better respond to nearby emergencies. Station 3 could see more staff even before more space is provided because it is staffed by only two people at a time, who can drive either an ambulance or a fire truck to an emergency, so two more people from another station constantly have to assist Station 3, Doughty said. Three Springs also needs a new station because firefighters in that area currently work out of a garage, Doughty said. “There is a drastic need for our us to build a more modern and adequate station,” he said. The garage would be replaced with a new station, with room for full-time staff, next to the police substation on Wilson Gulch Drive. The fire district is also planning to build a training facility in Bodo Industrial Park that would prevent the firefighters from traveling to Ignacio or Farmington to use facilities. With proper staffing and facilities, it’s also possible the fire district could achieve a better rating from the Insurance Service Office, which could lower fire insurance rates, Doughty said. “As a community, we can either say, ‘Having outstanding fire rescue and ambulance service is important to us or it’s not important to us.’ And the insurance company’s going to say, ‘Well, if you don’t have a good fire department, you are going to pay more for your homeowner’s insurance,’” he said. Voters in Durango can expect to receive their ballots by Wednesday or Thursday. Bayfield residents can expect their ballots Friday or Saturday. La Plata County Clerk & Recorder’s Office, 98 Everett St., Suite C, Durango.Bayfield Town Hall, 1199 Bayfield Parkway, Bayfield.La Plata County Administration Building 1101 East Second Ave., Durango.Farmer’s Fresh Market 535 Goddard Ave., Ignacio.Three voter service and polling centers will be set up to help with voter registration, replacement ballots, ballot drop-off, in-person voting and voting machines for people with disabilities.